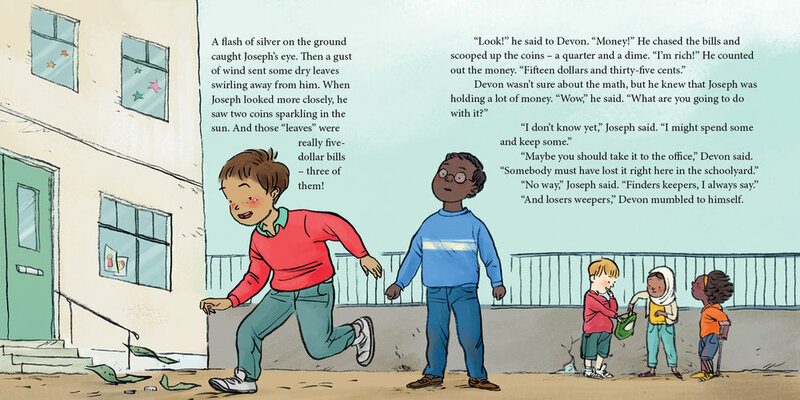 When Joseph and Devon find money in the schoolyard the two friends have different thoughts about what they should do. Joseph thinks they should keep it, but Devon thinks they should try to find out who lost it. When he sees their classmate Lin looking upset and looking for the same amount of money they found, he is sure that “finders keepers” isn’t the best rule to follow. But convincing Joseph to do the right thing isn’t going to be easy. How can Devon keep his friend and see that Lin gets her money back? It takes some courage and resourcefulness, but in the end, Devon proves to be a good friend to both Joseph and Lin. And, even though it was hard, making the right choice makes everyone—especially Joseph—happy.